Lately I've been revisiting some of my past topics and continuing the story with new research. Such is the case today. A relatively popular post of mine from 2010 called The Buzz on the Bees described a study from that year by Jerry Bromenshenk et al. investigating Colony Collapse Disorder (CCD). CCD describes the mysterious, sudden and serious die-off seen honeybee (Apis mellifera) colonies across the U.S. It is characterized by sudden colony death with a lack of adult bees in front of the die-outs. Honey stores and recent brood rearing are often evidenced, and sometimes the queen and a small number of survivor bees remain. The 2010 study found CCD colonies to contain an iridescent virus (IIV) (Iridoviridae; a DNA virus) that tracks with the microsporidia, Nosema apis and N. ceranae (specifically the latter), when compared to healthy colonies. This and previous scientific studies, using sensitive genome-based and proteomic methods, have also found small RNA bee viruses. These RNA viruses, alone or in conjunction with other pathogens, have frequently been implicated in CCD. A new study published a couple of days ago in mBio by Ji Lian Li et al. correspondingly takes a look at the role of viruses in CCD. Evidence from previous studies shows that viruses that cause common infections in honeybees also infect other hymenopteran pollinators. A study published by Singh et al. (2010) even showed these viruses to be present and infective in pollen pellets. I’ll conjecture that if you ask most people you’ll find that they don’t really think of plants as capable of getting viruses. That is until some disease comes and kills all of the fruit trees in their back yards. But plant viruses are like other viruses, obligate intracellular parasites, and they require a way to transmit from one plant to another. As you may have noticed, plants don’t generally get up and move around. This means that their viruses need a vector. Generally, these vectors are herbivorous insects. These insects are carriers, usually by carrying around infected pollen spreading the virus from one plant to another without themselves getting sick. To date, only a few plant viruses are known to also affect their insect vectors. Li et al.’s new study takes a closer look at the role of pollen in virus transmission in honeybees. Initially, they carried out a study to screen bees and pollen loads of bee colonies for the presence of frequent and rare viruses. This resulted in the chance detection of a plant virus, tobacco ringspot virus (TRSV). This virus is a type species of the genus Nepovirus within the family Secoviridae, and it is known to infect a wide range of herbaceous crops and woody plants. Like other members of this genus, TRSV has a bipartite genome of positive-sense, single-stranded polyadenylated RNA molecules, RNA-1 and RNA-2, encapsidated in separate virions of similar size. For you non-biologists, this basically means that the virus has two genome segments/virus particles and can be directly translated into the desired viral proteins by the host cell. RNA viruses typically mutate very fast and are really good at working around host defenses (HIV and hepatitis are good examples of RNA viruses). It is known that honeybees transmit TRSV from infected plants to healthy ones, but its presence in the researchers' screens got them to wondering if this plant virus could cause systemic infection in the exposed honeybees. To answer this, they collected adult worker bees, samples of the pollen being processed by a colony, and the ectoparasitic mite Varroa destructor (great name!) within the hive. They assessed 10 colonies for 1 year, classifying them as strong or weak based on the size of adult populations, amount of sealed brood, and presence of food stores. From their samples they purified virus particles from the adult bees and used them for cDNA library construction, virus-specific primer design, total RNA extraction, conventional RT-PCR, in situ hybridization, cDNA sequencing, and a phylogenetic analysis. The observations of the colonies revealed an increase in bee deaths starting in the autumn and peaking in the winter. 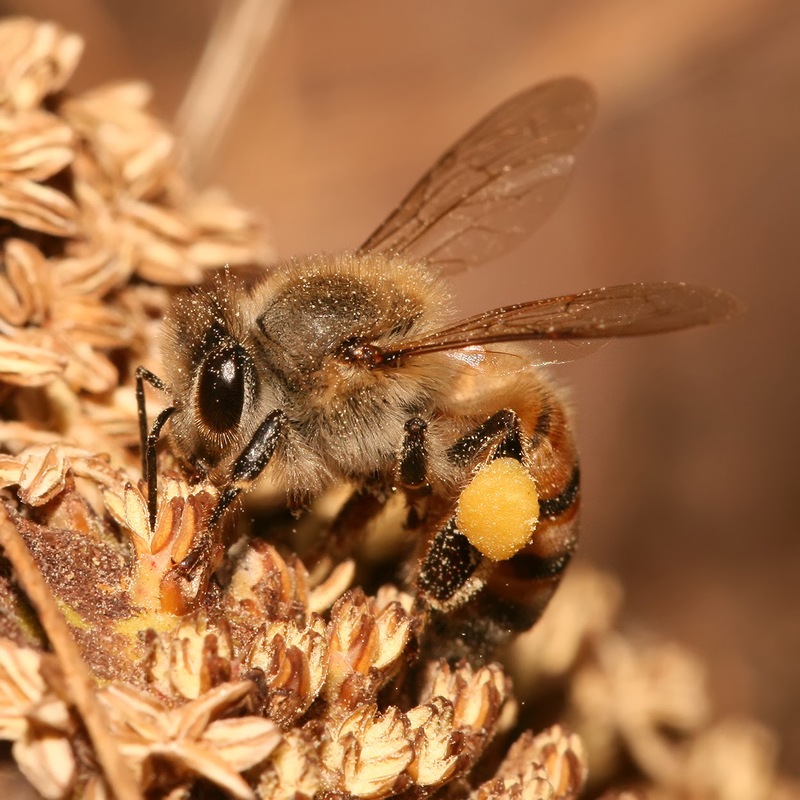 The researchers found both TRSV and IAPV (Israeli acute paralysis virus, common in honeybees) to be absent in colonies classified as strong, but both were found in weak colonies. Weak colonies too were found to have more multiple virus infections. These weak colonies were the ones less likely to survive through the cold winter months. Additionally, TRSV of the same strain was detected in the mites of infected colonies suggesting they obtain it from their bee hosts. These results are the first evidence that honeybees exposed to virus-contaminated pollen can also be infected and that the infection can be systemic and spread throughout their entire body. Any host jumping is not without its challenges. In order for a virus to jump to a new host it must have the opportunity to come into contact with a perspective host, undergo genetic changes so that it may enter a new type of host cell, and gain the ability to spread horizontally between individuals within the new host populations. It seems that TRSV has been successful in overcoming all of these challenges. Its presence in the mites suggests that they could be a vector for the horizontal transmission between colonies. However, food-borne transmission (via pollen) is the most important route for transmission. Their results suggest that TRSV is neurotropic (affecting the nerves) in the honeybees, potentially causing severe functional impairment of nerves and muscles. Do these results definitively conclude that TRSV is the cause of CCD? Well, no. But this study does add to a growing body of evidence that implicate parasites and pathogens as the key culprits. NY Times article: "Bee Deaths May Stem From Virus, Study Says"